Well, aren't you the lucky one! I have been in a creative and inspired mood in the kitchen looking for ways to create lovely meals for my family using anything but the oven! (Well, most of the time!) I did however, bake cookies last night, and now I remember how my Nanny and Paw Paw would cook their heavy stuff in the morning, and just reheat for dinner. So, next time I plan on baking something (which will be the brownies as part of Death By Chocolate for Father's Day.) I will do it early in the morning. Now that's what I call cooking! Anyway, for dinner tonight I decided to make a "sticky chicken" chicken legs, and steakhouse worthy Fan potatoes. Today we were going to a friends house to swim, and would not be home until close to four. It was nice, because all I had to do, was come home add cheese to the potatoes, and then steam some broccoli heat up some green beans (I was out voted!). With just a little prep the night before, this meal went together very quickly, and will become a family meal that we will eat more regularly especially during the busier times of our year (as when school starts). A large package of chicken legs deskinned. If your chicken is frozen, defrost the day before you plan on cooking this. If you did not remove the skin from the chicken before freezing, do so now. The night prior to cooking, rub down chicken with spice rub. 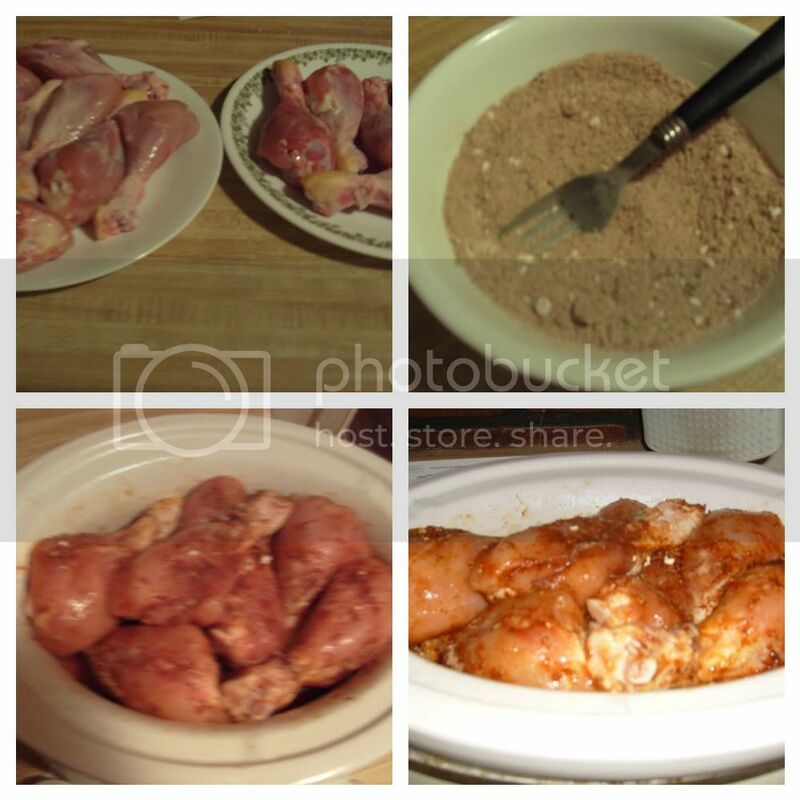 (If you know that you are buying the chicken specifically for this recipe later in the week or month you can deskin, rub down the chicken with the rub, and freeze as is.) In the bottom of your crock pot, place balls of foil to allow a spot for drainage for any extra juices that may come out of your chicken. Do not worry about your chicken drying out, because in the crock pot the juices that drain off will steam/baste the chicken to keep it moist. 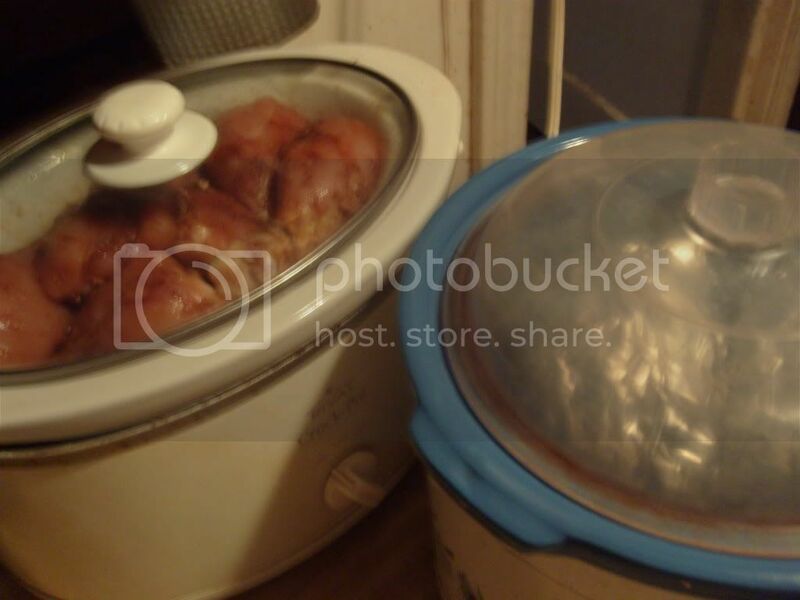 Arrange chicken in crock pot on top of foil. It is okay if they overlap. Cook on low 8 to 10 hours. 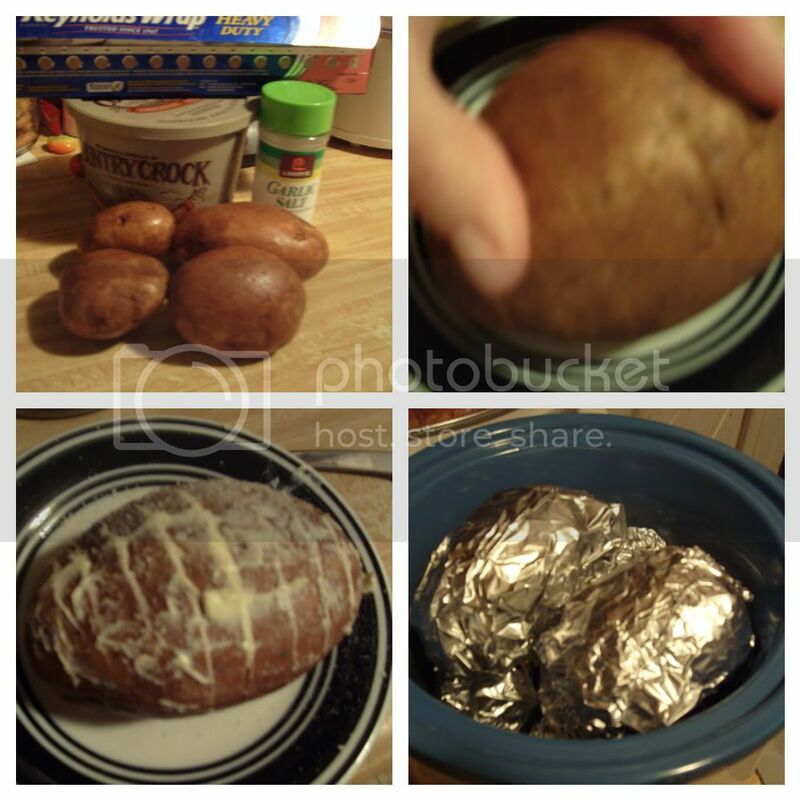 Rinse potatoes well. Cut slits into each potato (about 1/4 inch apart from one another) careful not to go all the way through. Cut down about 3/4 of the way. Slide butter into the slits (as well as you can) and rub tops with butter. Sprinkle garlic salt liberally. Wrap in foil. Bake on low 8 hours. Remove and immediately add shredded cheese and a dollop of sour cream. Mix well until blended. You can rub down your poultry, pork or beef with this rub and allow it to marinate into the meat. Store in an air tight container. Yes that is my plate ~ on a saucer! Perfect portion! ﻿ Do you have some favorite go to crock pot meals that help keep your kitchen cooler in the hot days of summer, or dinner come together easily on a busy school night?! I would love to see them! Oh girl, I'm going to have to come back and copy this! Yum!!! !